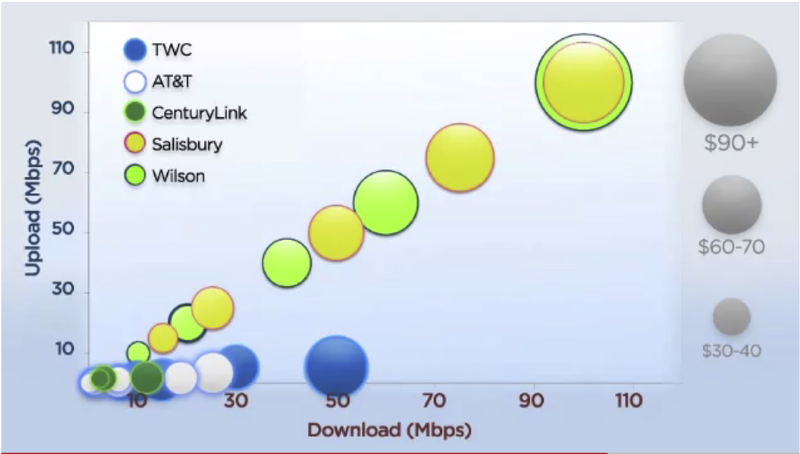 This single picture, prepared by the Institute for Local Self Reliance, says it all: The yellow and green dots represent the download (x-axis) and upload (y-axis) speeds provided by two community networks in North Carolina. Their size represents their price. As you can see, community networks provide faster, cheaper service than their commercial competitors. And they provide much faster service overall. Local competition in broadband service benefits the citizens who have demanded it. For that reason, community after community in North Carolina have passed resolutions asking you to give them the chance to provide the Internet service that the national quasi-monopolies have not. It is why businesses from across the nation have opposed the bill, and business leaders from your state, including Red Hat VP Michael Tiemann, have called upon you to veto the bill. Commercial broadband providers are not happy with this new competition, however. After spending millions in lobbying and campaign contributions in North Carolina, they convinced your legislature to override the will of local North Carolina communities, and ban these faster, cheaper broadband networks. Rather than compete with better service, and better prices, they secured a government-granted protection against competition. And now, unless you veto H. 129, that protection against competition will become law. Opponents of community broadband argue that it is "unfair" for broadband companies to have to compete against community-supported networks. But the same might be said of companies that would like to provide private roads. Or private fire protection. Or private police protection. Or private street lights. These companies too would face real competition from communities that choose to provide these services themselves. But no one would say that we should close down public fire departments just to be "fair" to potential private first-responders. The reason is obvious to economists and scholars of telecommunications policy. As, for example, Professor Brett Frischmann argues, the Internet is essential infrastructure for the 21st century. And communities that rely solely upon private companies to provide public infrastructure will always have second-rate, or inferior, service. In other nations around the world, strong rules forcing networks to compete guarantee faster, cheaper Internet than the private market alone would. Yet our FCC has abdicated its responsibility to create the conditions under which true private broadband competition might flourish in the United States. Instead, the United States has become a broadband backwater, out-competed not only by nations such as Japan and Korea, but also Britain, Germany and even France. According to a study by the Harvard Berkman Center completed last year, we rank 19th among OECD countries in combined prices for next generation Internet, and 19th for average advertised speeds. Overall, we rank below every major democratic competitor -- including Spain -- and just above Italy. In a world in which FCC commissioners retire from the commission and take jobs with the companies they regulate (as Commissioner Baker has announced that she will do, by joining Comcast as a lobbyist, and as former FCC Chairman Powell has done, becoming a cable industry lobbyist), it is perhaps not surprising that these networks are protected from real competition. But whether surprising or not, the real heroes in this story are the local communities that have chosen not to wait for federal regulators to wake up, and who have decided to create competition of their own. No community bans private networks. No community is unfairly subsidizing public service. Instead, local North Carolina communities are simply contracting to build 21st-century technology, so that citizens throughout the state can have 21st-century broadband at a price they can afford. As an academic who has studied this question for more than a decade, I join many in believing that H.129 is terrible public policy. But it is as a Democrat that I implore you to take a stand on this issue, and veto this bill. Many of us Democrats have been enormously disappointed by the failure of our party to stand for principles that matter. There's always an excuse for ducking a fight -- which it seems only our side ever sees. Ideologues on the far right have radically remade public policy throughout the nation, while moderates and progressives keep their heads low. And many of us are now embarrassed to even read the slogan that earned the Democratic Party the presidency and control of Congress in 2008 -- "Change you can believe in." The only real change that we have seen is in the extraordinary effectiveness of the far right to define the nation's agenda and, though a minority party, force it upon the nation. And when the far right aligns with the endless stream of corporate lobbying and campaign cash, it seems that there is no issue that the majority of citizens can actually prevail upon. Be a different kind of Democrat, Governor Perdue. I know you've received thousands of comments from citizens of North Carolina asking you to veto H.129. I know that given the size of the Republican majority in the legislature, it would be hard for your veto to be sustained. But if you took this position of principle, regardless of whether or not you will ultimately prevail, you would inspire hundreds of thousands to join with you in a fight that is critical to the economic future of not just North Carolina, but the nation. And you would have shown Republicans and Democrats alike that it is possible for a leader to stand up against endless corporate campaign cash. There is no defeat in standing for what you believe in. So stand with the majority of North Carolina's citizens, and affirm the right of communities to provide not just the infrastructure of yesterday -- schools, roads, public lighting, public police forces, and fire departments -- but also the infrastructure of tomorrow -- by driving competition to provide the 21st century's information superhighway. You can follow similar fights on Twitter by searching #rootstrikers.